Apparently they've been at this before, but "Departure of Reason" is my first experience with Jessica Pavone and Mary Halvorson's duo project. Avant-folk/jazz/rock or something, I find it an interesting, eclectic, exciting and rewarding listen. The album begins with a strident rhythm guitar played by Halvorson. It has a clean, vibrant, and electric sound and over it Pavone's adds a folkish Eastern European inspired melody on her rich toned viola. Highly composed, there are quick unison runs that begin to reveal complexities within the composition. The improv sections begin and end seamlessly, blending back and forth into composed melodies. The chords at the start of 'Hyphen' are quite interesting. Smoothing out the dissonant progression are lush chords that Halvorson then lightly applies her signature pitch bend to. Pavone joins in on a challenging note and the two then begin a slightly macabre dance. It's a delicious darkness though, once again, a melody that seems more than it appears at first blush. 'Begin Again' is another song that has an overall dark feel, this time the melody more swirling and elliptical. The combination of the hollow body guitar and viola tone is thick but brittle, with dark rich overtones. Then, there are the vocal tunes. Seemingly interpolated somewhere between wholesome folkiness and the esotericism of progressive rock, the songs are beguiling and captivating. The lyrics touch abstractly on the human condition, "Belief," they sing in 'Saturn', "is the departure of reason" or just the abstract, "In the city of events, on a Tuesday sometime before then… " begins 'The Object of Tuesday'. The vocals come off as somewhat dry - be it with wit or wisdom - suiting the instrumental textures well. The duo stretches the boundaries, veering fearlessly from folkiness to avant jazz to heavier rock, without relying on electronics or other types of musical programming to fill out the delicate space. I like it more each time I hear it and will probably delve into their back catalog too at some point too. Looks interesting. I remember seeing them at an Instant Jazz party (here in Belgium). It was fun, if a little bit 'intellectual parlour music' for me. However, your review makes me curious to give them re-listen! 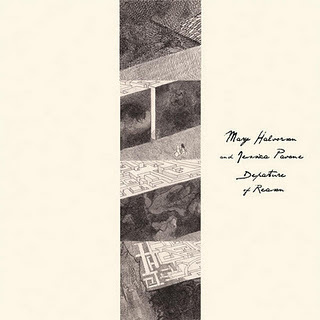 I love Mary Halvorson's album with Weasel Walter and Peter Evans. It might be my favourite album that I discovered on this site. I'm planning on getting another of her albums. She has a duet with Walter which I had thought about. I think her playing suits itself well to be matched with percussion, and it would be interesting to compare to Derek Bailey's many duo albums. But this sounds good too. Decisions, decisions.